The H2O SOS Shut-Off System is an automated water leak detection system that provides 24/7 protection against flooding due to internal plumbing / pipe failures and accidental overflows. This innovative product automatically shuts off the water supply instantly upon detection of a water leak. It is designed for use in residential, commercial, and industrial buildings. Using sensitive electronic sensors at all points in the building's plumbing system that are vulnerable to water leaks (including hot water heater tanks, dishwashers, clothes washing machines, refrigerator icemakers, under toilet tanks, central humidifiers, and under sinks), the H2O SOS leak detection system constantly monitors the building. As soon as a leak is detected, the controller sends a signal to a special shut-off valve installed on the main water supply line. This instantly closes the valve and shuts off the water supply to the building, thus preventing the leak from turning into a catastrophe that could cause thousands of dollars in property damage and an immeasurable amount of inconvenience for the owner. 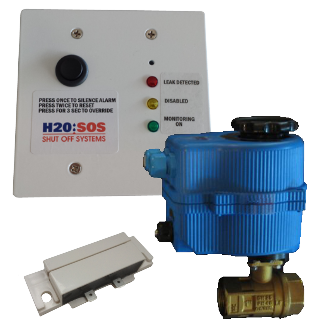 The H2O SOS is a fully-automated water leak detection system that integrates micro-chip controlled sensors and an active shut-off valve to provide peace-of-mind and security against water leaks and resulting flood damage in your home or business. the deductible on just one insurance claim is generally more than the cost of an H2O SOS system! water leaks can and do happen at any time - usually when you are not home or when you are asleep. Chances are relatively high that by the time you notice the leak, damage will have already occurred. over a quarter of a million homes in the U.S. annually experience a significant water leak and associated property damage. more than 5 million hot water heaters rupture and cause household damage in the U.S. and Canada every year. In 1996, a major North American Insurance Bureau reported that the number of claims from water damage to homes ranked third (about 20% of all claims), but ranked first in total dollar damage at over 50%. Some surveys show the number of flood-related claims could be much higher, as many go unreported. Many insurance companies offer discounts to homeowner policies where an active water leak detection system is installed, with even higher discounts when connected to a monitored security system. Ask your insurance agent about possible premium discounts.